Even if you've had a baby before, giving birth to twins is a different experience. While no birth is typical, there are a few things that women expecting twins should prepare for and discuss with their healthcare provider. The position of the babies in the uterus will largely determine how the twins are born — vaginally or by cesarean. About 40 percent of twins are both head down (vertex) at term, another 30 percent see the first baby (Twin A) vertex and Twin B in a breech position. Both of these positions are acceptable to consider a vaginal birth. 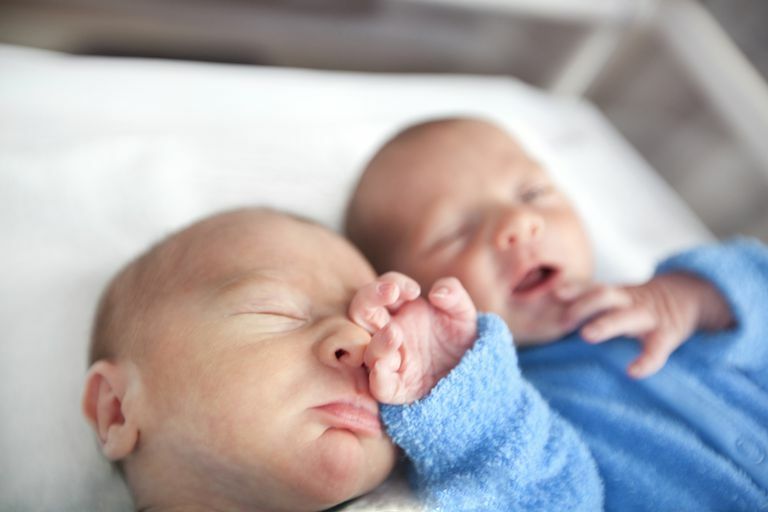 There are scenarios where a cesarean is advisable in twin birth, such as when both babies are breech. Usually, this is known ahead of time with ultrasound technology. However, twins can change positions late in the game, even into labor. This is particularly true of Twin B after the birth of Twin A. More than half of twins will be born vaginally. The good news is that even though you have two babies you only have to labor once! Once the cervix is open, each baby will have its own pushing stage. This means you will have to push twice, but the majority of the time the second twin is born much more easily than the first. This is because the first twin has paved the way, so to speak. The average time between the birth of the first and second baby is generally about 17 minutes. However, as long as the monitor shows the second baby is doing well there's no great need to speed things along. Sometimes during this phase of waiting, you will have an ultrasound to confirm the position of the second twin and your practitioner will decide how it is best to deliver him or her. While having twins does increase the chances of having a cesarean, fewer than half of twins are born this way. While the positioning of your babies will play a large part in the decision as to what type of birth you will have, there are also all of the normal reasons for cesareans. These include placenta previa, placental abruption, maternal indications like PIH, active herpes, and labor complications like fetal distress. If you give birth by cesarean prior to labor, the date will most likely be set between 37 and 40 weeks. If you go into labor prior to the scheduled date, your cesarean will likely happen then. The post-cesarean recovery period with twins is generally the same as with a singleton birth. This is a situation that is fairly rare. One baby being born vaginally with the second twin being born via cesarean occurs in only about 4 percent of all twin births. Usually this is done for an emergency with Twin B, like a cord prolapse (when the cord comes out with or before the baby, thereby cutting off the baby's oxygen supply. ), severe malpresentation (like a transverse baby that cannot be moved by internal or external forces), or placental abruption (when the placenta tears away from the wall of the uterus prematurely). More than half of twins will be born prior to 37 weeks. This can also affect how your babies are delivered. Talk to your practitioner about staying healthy and maintaining adequate hydration, rest and nutrition to care for your growing babies and body. Some hospitals require that all twin mothers give birth in the operating room, even if they have a vaginal birth. You might also ask about the use of epidural anesthesia, as it is also sometimes a requirement, even if there are no medications placed inside the tubing. This allows immediate anesthesia should it become necessary. There may be other concerns you have like rooming-in or breastfeeding two babies. Be sure to talk to your hospital at length about issues you may be concerned about with your babies. No matter how your twins come into the world, be prepared for a sudden change. Be willing to accept help when offered and take the time to get to know each of your new little bundles of joy.